The Chuckit Sport 25M Ball Launcher is the original Classic Chuckit Ball Launcher but with a new and improved ergonomic grip and upscale look. It is 2.5" ball compatible. 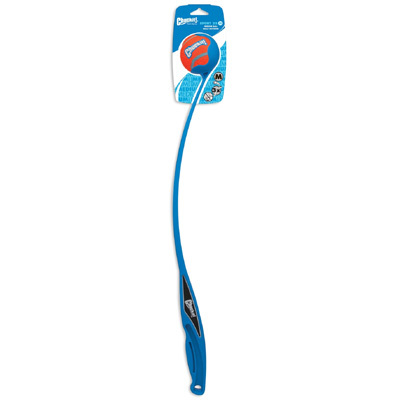 Chuckit ball launchers are a great way to exercise your dog without wearing out your arm. You can throw the ball easily and further than ever before, with no need to stoop too far down to pick up the ball or get dog slobber on your hands. Use it in the park, in your backyard, or anywhere you and your dog fancy a game of fetch, but you will throw further than ever before so a certain amount of space is needed. Designed for hands-free pickup, so you never have to bend down as far or pick up a slimy ball again. 25 inches long (64cm). Made of lightweight, durable plastic. This Chuckit Sport 25M Ball Launcher is the standard original dog ball thrower with some handle improvements. It takes standard tennis balls or 2.5" Chuckit balls. Click here for our selection of dog balls. Brilliant gadget, we have great fun with this in the park, so much better to launch than throwing and goes a lot further, would definitely recommend. Whoever invented this is a genius. Loved the idea of sitting on my tushi and launching balls without running around, however my puppy has not quite worked out that you are meant to bring the ball back and so I am still chasing after them myself. The launcher is great though can get some super distance on the flight and it is light & comfortable to carry around. Tire your dog out in less time. We have a spaniel and he loves to tear most things apart. this ball is still in one piece and the launcher gives so much extra distance with less energy.